Missing San Angelo Teen Found Safe! Updated 7/31/2018 5 p.m. San Angelo Police have found the missing girl. According to SAPD Public Information Officer Tracy Gonzalez, Police found Anna Ross today and she is safe. SAN ANGELO, TX — (Press Release) Have you seen this girl? 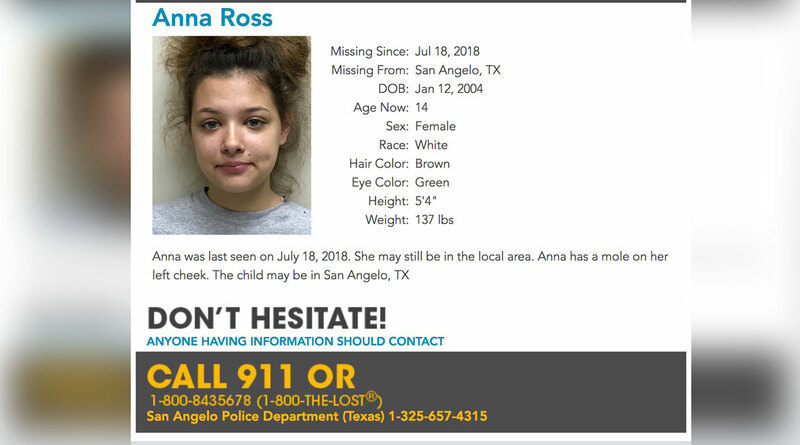 Anna Ross was last seen on July 18, 2018. She may still be in the San Angelo or surrounding area. Anna has a mole on her left cheek. Anna is 14-years-old. She has brown hair, green eyes, weighs 137 lbs., and is 5’4” tall. If you have information about Anna's whereabouts please send a direct message. To remain anonymous, tip online at http://bit.ly/SAPDTips247 or by text: text TIP SAPD to 888777 and follow the prompts.